In this episode of Turning Lemons Into Lemonade, I interviewed the amazing Liz Czepiel. Liz spent years in corporate as a productivity coach to Fortune 500 companies and their teams! Over time, she felt pulled to launch her own business – so she started a “side hustle” consulting. For a couple of years, she was constantly juggling her corporate career – AND her consulting business! Despite achieving tremendous success, she still had that common issue that many women entrepreneurs face “imposter syndrome.” She felt tremendously confident in her skills in corporate. But as an entrepreneur, she started worrying about “who do I think I am offering these services on my own?” She had these fears – DESPITE all her successes. So she did what she thought was right at the time – so she shut down her business, closed the LLC – and went back to corporate full time. It didn’t take long back in corporate for her to feel that tug again to re-launch her consulting practice. So she did it again! But this time, she realized that she couldn’t straddle the fence (or as my friend, Kelly Lucente says, she couldn’t ride two horses with one a**). So she took the brave step and went all in on her consulting business. Today she’s built a six figure consulting business that fits her goals and her lifestyle! She loves what she does, and loves making an impact! I also shared the story of how when I was launching my first business, my long term corporate boss said they no longer wanted me part time, and that I had to either commit to full time or leave entirely. As painful as it was to lose that identity and stable paycheck, I can honestly say that my own business may not have ever been profitable had I still had that corporate income to rely on – never the less, would I have turned that into THREE multi-six figure businesses in seven years! 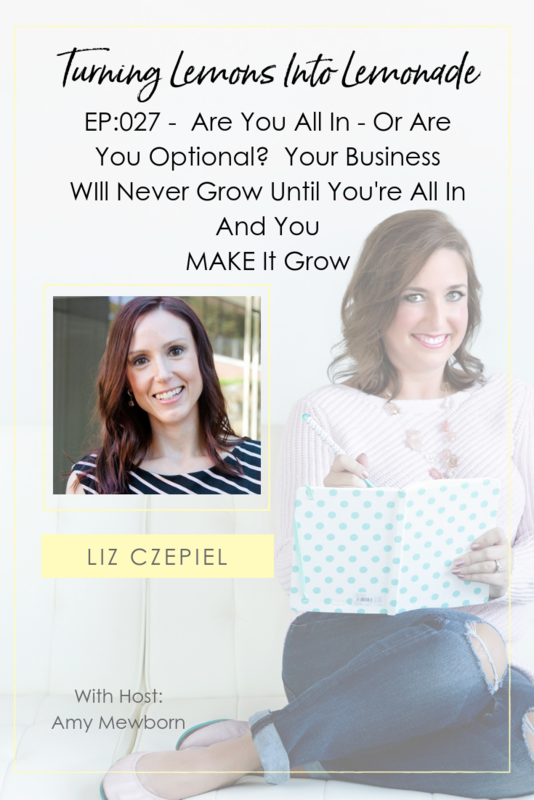 To hear more about how both Liz and I cut the cords – and went all in on our businesses, listen to this episode of Turning Lemons Into Lemonade here!